Blocking" is a finishing step in your knitting when you straighten and even out stitches, usually with heat or moisture. Blocking is also done again after you wash a knitted item. Blocking after knitting will set the item into its final shape. 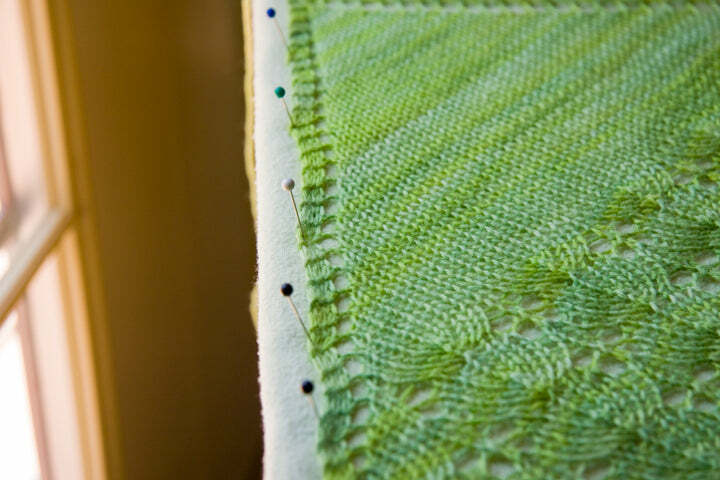 While most knits should be blocked to make them look their best, lace blocking also functions to open up the stitches and create a little tension between the open and dense areas in the lace. Blocking a sweater might only need a little bit of steam; lace blocking needs full-on wet blocking. A large flat area that you can push the pins into. 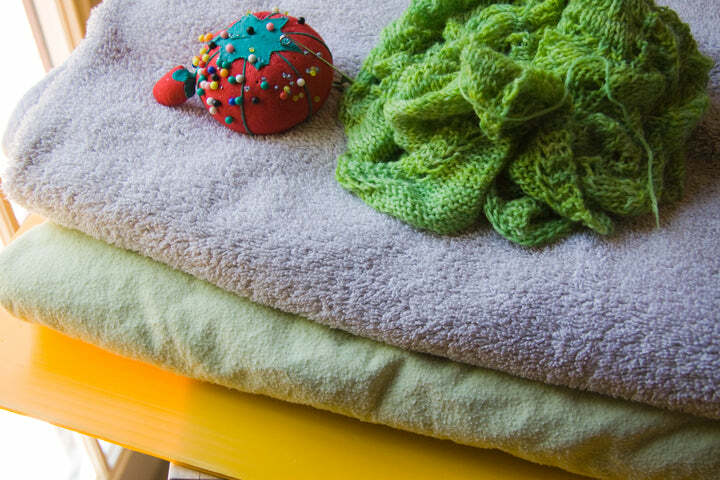 This can be blocking mats, a thick folded towel, a mesh drying rack. I actually use something called Coroplast, a corrugated plastic that comes in large sheets from the building supply store. It's very light, is soft enough to pin into, and is quite inexpensive. 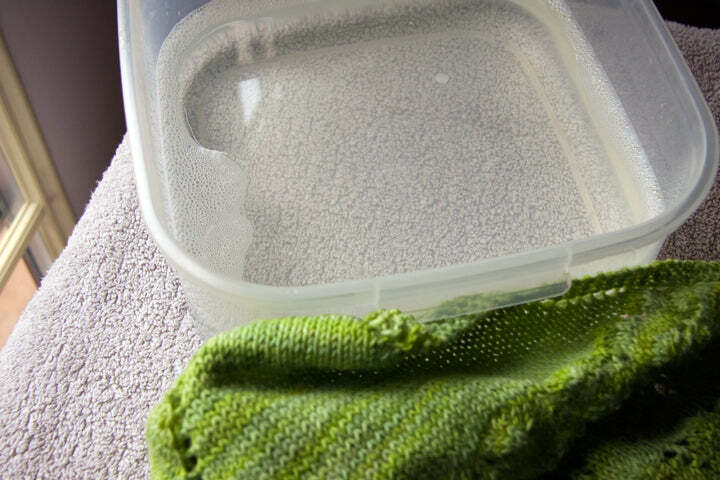 Fill your container with tepid water and add a few drops of detergent. Add your item and get it thoroughly wet. Push it under the water to make sure it absorbs water. Let it soak. I soak my lace anywhere from 20 minutes to several hours. You want the fiber to get completely saturated and relaxed. Some fibers take longer than others. 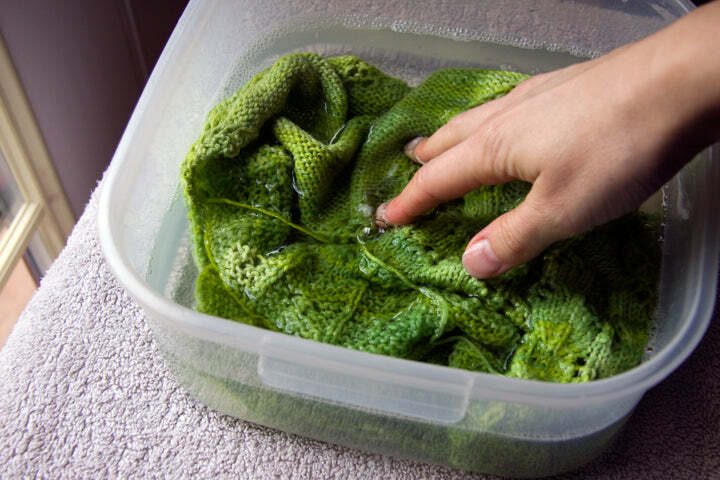 Pure wool, for example, resists saturation, and needs to soak for longer. Cotton and rayon become saturated quickly, and don't need to soak long. In this example, I'm using a sock yarn, which has superwash merino and nylon in it. Since the blend is designed for socks, it is particularly resilient. I let it soak for about 2 hours. 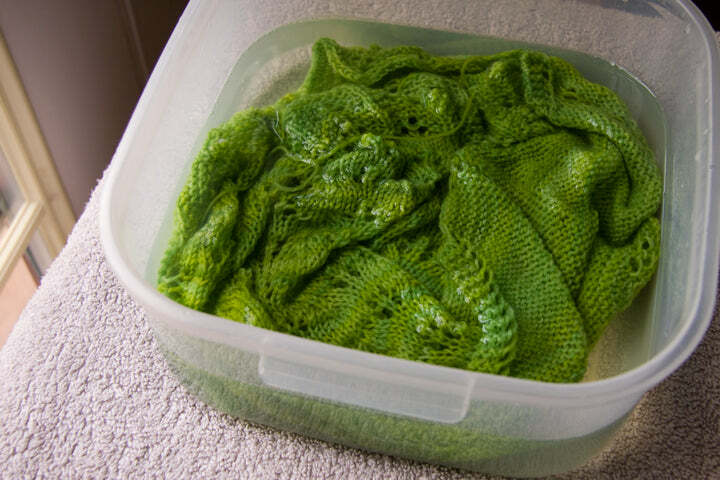 If this weren't a shawl, I wouldn't normally soak superwash for very long at all, as water tends to make superwash grow. Run tepid water into the container to rinse, until the soaking water runs clear. Gently lift the item out, supporting all of it in your hands, and squeeze out the water. Place it on a towel. 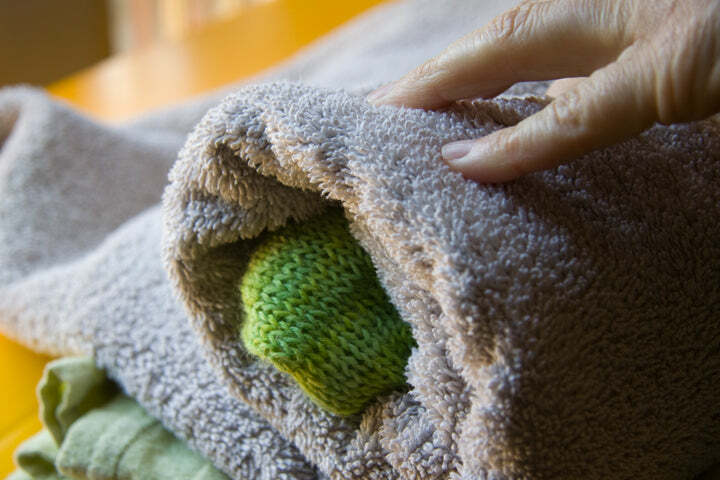 Carefully, without pulling, spread out the knitted item on the towel, and roll up the towel like a jelly roll. Press down firmly to get out as much water as you can. Now the fun part: the blocking. 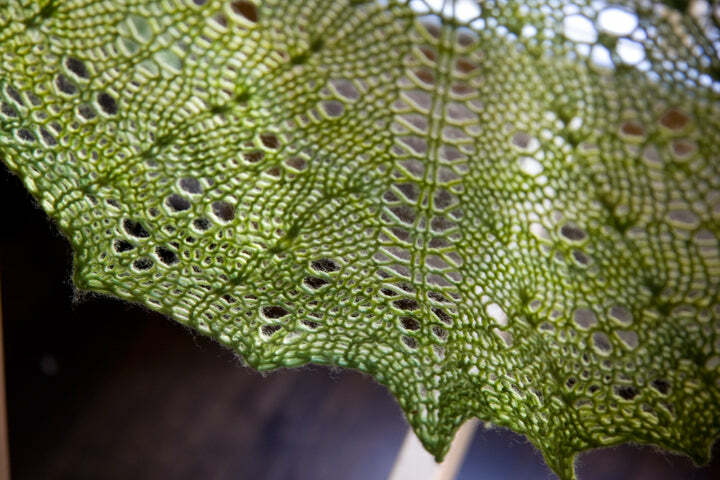 Spread out your knitted lace, gradually pulling and nudging it into shape. You are trying to open up the lace and put a little bit of tension on the yarn, but be careful not to over stretch the fiber. Go gradually, and just be aware of how much strain you're putting on the wet fiber. Be a Yarn Whisperer. Many lace stitches have a scalloped edge. If there are scallops that you want to accentuate, stretch them and pin them in place. 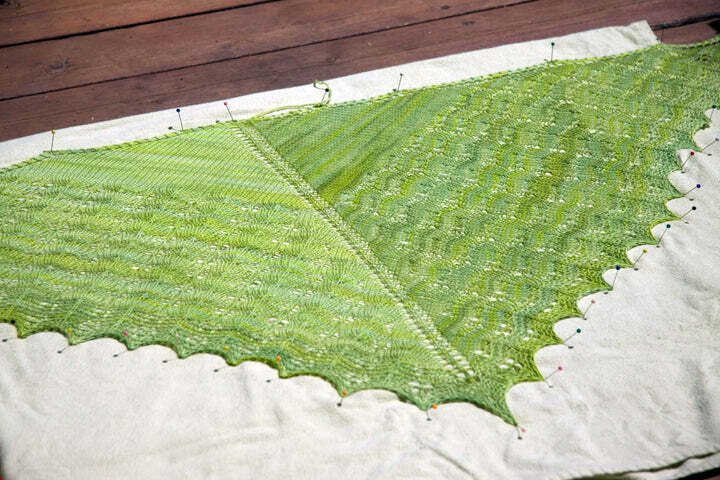 Along straight edges, like the top of this shawl, use as many pins as you can. A ruler really helps to pin an edge in a straight line. Get the whole thing into a place with some air circulation if you can. Outside in the sun is great (but don't leave it in direct sun, which might fade the color), or put a fan next to it. I put this one in the sun and it dried in about 10 minutes. 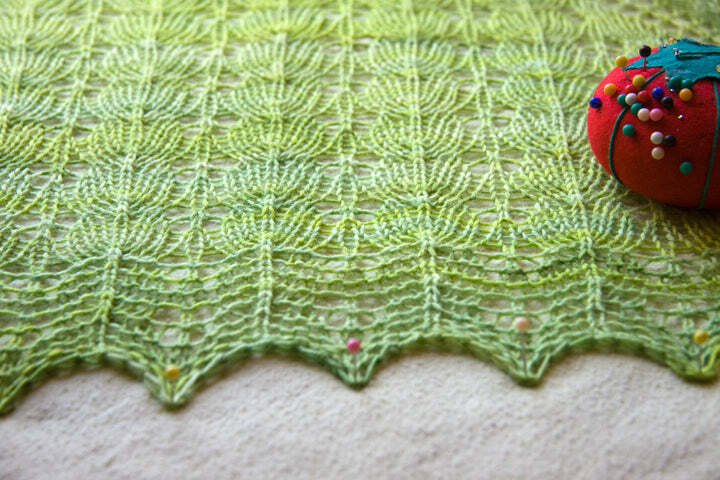 Here's a closeup of the blocked lace. You can now clearly see the dense areas where the decreases are, and open areas made by yarn overs. The outline of each stitch is visible. You wouldn't do this with stockinette on a sweater, where you want the stitches to be more dense, but with lace, it's desirable.